The Annual Spectacular Big Red Box Sale! Big red box, you think? Huh, what's this guy rambling about now? 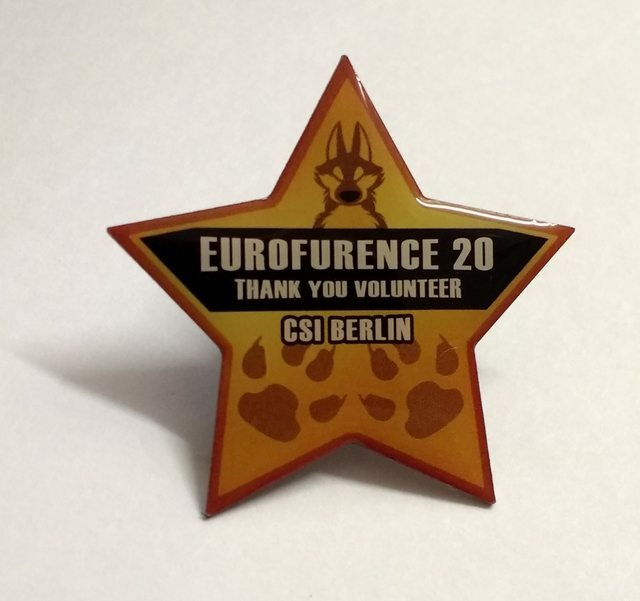 As you know or may not know, Eurofurence merchandise normally is a convention-exclusive perk as for a variety of reasons we do not run a web store, so normally during the year all merchandise is tucked away securely in our storage and collecting dust. However... last year, there was a big red box involved. We've put a bit of merchandise away because there always was the odd request after the con, and people always were super sad when they were told to wait another year to pick up their stuff. ...Nobody has spoken up this year, of course. And so now I'm stuck with it, taking away floor space. As you can see, it has been merrily blocking access to my exercise bike since September, making me fat! So I want to get rid of all this cheap tat. And this year's charity needs a shitload of money. Mmmm. You know where this is leading to, right? The Great Limited Time Only Buy Whatever Is In That Box Charity Drive! That's right! 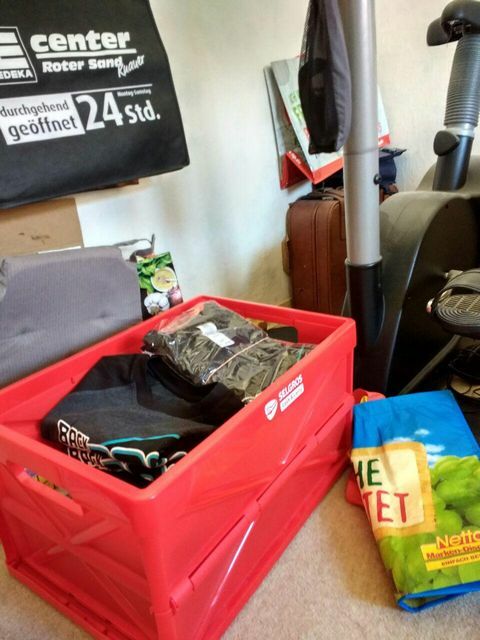 Despite it being not EF, you can now get all the EF swag that's in this box! T-shirts! Trees! Things we don't even know what they originally were! Bet you want to know what's in it, right? Well, I made a list! So what about the "charity" bit, then? 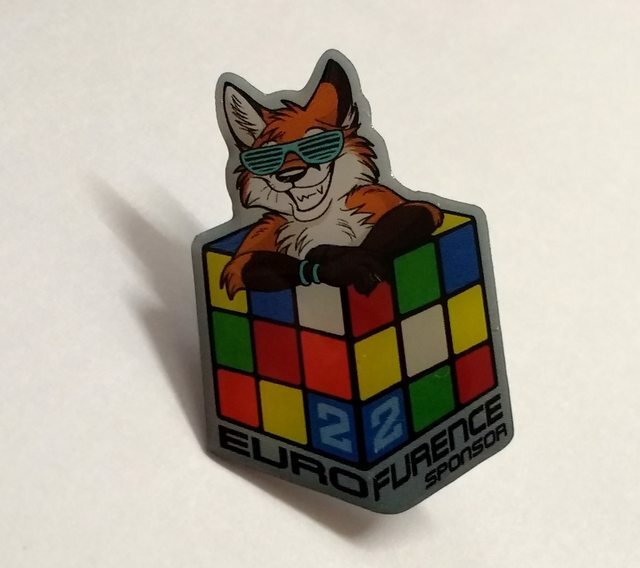 Well, the good news is that all proceedings from the sale of this wonderful collection of EF swag will be going right to this year's charity, Sieben-Katzenleben! You get your stuff, they get the money, and I finally don't need to climb over that stupid box anymore to get to that part of my bedroom! Sounds dandy, right? Well, here's how it works. Since that whole thing is a bit out of our normal modus operandi (mainly because it's a fly-by-night operation by yours truly, triggered by nearly tripping over that damn thing AGAIN last night), you take your pick of merchandise, and either send a private message here in the forum, or, if you don't have forum access, drop a line to shop@eurofurence.org, stating your name, the items you want and the address you want them shipped to. Since this is a charity drive, it's PWYW, but I recommend a price of at least €15 for the t-shirts. I will then get back to you and calculate shipping (it varies on the size of the items and the place they're going to), and the final amount can be either paid by bank transfer or PayPal, the final tally will be forwarded to the charity in one sum in a few months' time (I estimate May or thereabouts) so everybody gets a chance to get their paws on the fabulous items here! Did I mention the police badge and flashlights are the last of their kind? Hint, hint! You won't get them anywhere else! Re: The Annual Spectacular Big Red Box Sale! Woo! A bunch of stuff is gone already, and we've got a three-figure amount in donations so far! I'll be sending out the first batch of stuff later this week. If you've ordered an item that doesn't fit into a standard envelope, I'll be shipping your things next week as I need to arrange for suitable packaging first (i.e. nck some boxes from somewhere). By the way, the EF20 shirts are the absolute last of that con. Once they're sold, EF20 is history. Nada, niente, nothing left! And since some of you asked - international shipping is either 3.70 EUR or 7.00 EUR depending on your total order weight (this is because the tarrifs for thick letters >1cm are seriously weird around here). Good news! I've got rid of enough stuff to move the red box away. However, I still can't access my exercise bike. 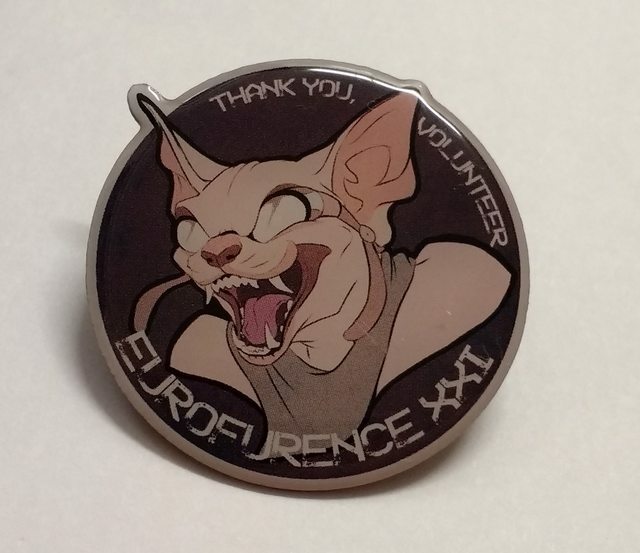 Help me (and of course the cute, adorable kittens) by buying what's left so I don't have to drag it all back to the EF storage again this summer! Buy! Spend! Consume! Make small fuzzy critters happy! Give it some time, it's not even been a week since EF. The last sale was announced in February.